Since long $1 gas is over, big “2-digits cylinders” gas-guzzlers vanished from the streets and collective eco-consciousness grew to the point that cars and leisure vehicles industry did not have choice but to respond to the new reality. And the popular vote was quite unanimous: smaller, energy efficient cars and lightweight travel trailers started winning not only pockets but also hearts and minds of American society. Lite-weight travel trailers and “pushing limits” extra-lite models became the must in portfolio of any serious manufacturer of leisure vehicles addressing mass market of middle-class buyers. “Necessity is the Mother of Inventions”, so no wonder, US manufacturers made an enormous effort to certify new lighter (but sturdy) materials, and to come up with new design ideas that can meet growing demand for lite-weight models of travel trailers and motor-homes. Lightweight, eco-friendly, weather-resistant, long-lasting and still comfortable and elegant – these are not only trendy words in our times, these are becoming a “new religion” in times when most of us realized that Mother Nature will not endlessly tolerate our “excesses”! And let’s face it – with the current trends and new emission regulations, we will see on our roads more and more hybrids and all kinds of all-electric vehicles. Hummers are already part of the past (not that “nobble” BTW), with them we also said “goodbye” (but not “see you later”) to gas-guzzlers that once dominated our roads. Hopefully – it will stay like that forever…. These days almost every manufacturer of recreational vehicles has in its offer light-weight travel trailers. It’s simply a “must” as customers are not only more and more environmentally-conscious but also more and more cash strapped. 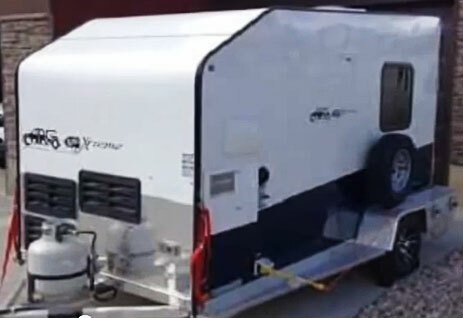 As the result they look for lightweight, aerodynamic travel trailers to minimize the cost. Obviously such brands like Palomino, Coachman, Dutchman, Starcraft, Jayco, Forest River – to name only few “big names” – all have “lite” solutions in their product portfolio. On this page however we would like to present some of US manufacturers that are fully dedicated to lightweight and ultra-lite campers. We do not pretend to give you all the details; the following should give you just ideas as of what to look for and where to find it…. Like most big stories – Scamp business started small and somehow inadvertently. In July 1971 Duane Eveland received surprising proposal from Bolar American (branch of Canadian company) to manufacture for them travel trailers. It was a tempting proposal because Eveland’s responsibility was limited only to manufacturing (usually the most interesting part of the process), while Bolar was taking the marketing business. Unfortunately “honeymoon” lasted shortly; Bolar America went out of business leaving Eveland (and his family partners) on his own. And that is when Scamp came into the picture (and market). In late 1972 first hundred and something 13 ft trailers named “Scamp” left the “garage” floor (yes, beginnings were very modest). Today, Eveland’s Inc. is still a family business managed by Duane’s son - Kent Eveland. 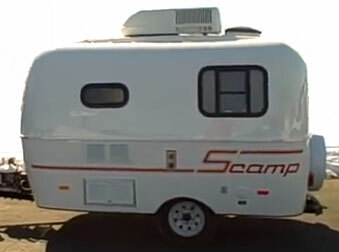 Scamp travel trailers are classic units – fiberglass shell provides rigidity, compactness and convenience. Lite-weight allows them to be towed by small family cars and guarantee fuel efficiency. Small size guarantees maneuverability not only on campgrounds but also on the streets. And finally, you have high quality that stands out. Looking at company’s impressive line of “automotive-campers” it will be difficult to guess that Livin-Lite is a newcomer in the market of recreational vehicles. The company located in Wakarusa (Indiana) was founded in early 2000’s by a visionary enthusiast of RV-ing Scott Tuttle (currently President of Livin’ Lite). His idea was simple: bring RV-ing to the heart of American society – young families owning mid-size cars, minivans, small SUVs. To do so, he had to make revolutionary changes to the industry: make campers light, towable by cars that are becoming smaller, more fuel efficient and eventually “greener” (hybrids, EVs…). But he also knew that to compete with the existing market, these new campers will have to provide comparable features: enough of living space, amenities we already used to have (kitchen, bath, entertainment…) and elegance. But Scott Tuttle went even farther adding one more dimension to his campers: durability for on/off road and “all-weather” conditions. Today Livin’ Lite offers a wide line of campers including “re-invented” pop-ups (Quick-Silver series of tent trailers), travel trailers (Camp-Lite series), truck campers, toy haulers (Axxess series and just coming on the market Polaris) and fifth wheels. For lovers of wilderness Livin’ Lite designed BearCat series of off-road campers because, as the company rightfully points out that 99% of our planet is “unpaved”. It should not surprise anybody that bear-Cat series includes tent camper (BC 8.0) travel trailers (BC 11FK & 13BHB) and toy-hauler (BC 16FK) to fit various needs. "Live" colors add to the elegance of Camplite travel trailers - so it is "all-in-one" (camper): Beauty, energy efficiency, durability.... And that comes back to ONE: Customer's satisfaction! 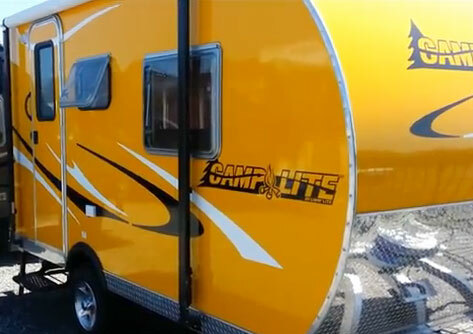 Popular series of Camplite travel trailers includes models ranging from Camplite 11FDB (11ft, 1995 lbs) and Camplite 11FK (hybrid, 11ft, 1800 lbs) through larger 13ft, 14ft, 16ft and 21ft models to the largest one Camplite 28BHS (25’6” long box, 4250 lbs dry-weight and slide-out). It’s difficult to shortly present so many models, so let’s make it short – Livin’ Lite can meet demands and expectations of most of customers – from entry level, small and “feather-lite” models to long toy-haulers that can sleep 8 persons and still will have room for your favorite “toys” (quad, motorcycle, ATV etc…). All of them are made of aluminum and composite materials, so aluminum frame, sidewalls, decking and even cabinets. Laminated plywood sheets used in sidewalls of most campers have been replaced by moisture resistant, light-weight and thermally isolating sheets of Azdel SuperLite. To prevent oxidation (corrosion) all-aluminum LiteTech frames are E-coated. Very little is left for steel (steps and stabilizer jacks) and plastic (trims, tanks and fragments of bath). The bottom line is – Livin’ Lite campers are designed to withstand the test of time - be it rot, mold, decay or corrosion. And good news for all nature-oriented and environmentally-friendly “souls” – they are almost 98% percent recyclable! So how the market responded to Livin’ Lite campers? Well, when almost all RV businesses struggled with shrinking economy in last 10 years, Livin’ Lite business skyrocketed! The company was rated No.1 for their ultra-lite trailers by JR Consumer Resources. Scott Tuttle gives a walk-through demonstration of the 2011 VRV All Aluminum Toy Hauler by LivinLite. In 2013 Livin’ Lite was acquired by Thor Industries Inc. – multinational business representing world’s largest manufacturers of recreational vehicles. EverGreen Recreational Vehicles LLC is another newcomer to the business of recreational vehicles. They were founded in 2008 and are located in Middlebury, IN. Starting the business they coined the motto: “Ultra-Lite camping doesn’t equate to a lack of quality or features” and they successfully stick to this philosophy. As the result, today Ever-Green R, is recognized for designing and manufacturing Eco-friendly, ultra-lightweight and durable travel trailers and fifth wheels. Following their deep conviction that “being green” is not anymore a fantasy of few “eccentrics” but a requirement of our century, thanks to “out-of-the-box” thinking they created new generation of “sustainable” travel trailers. Making use of recyclable, higher quality and long-lasting materials they successfully replaced heavy and prone to rotting wood and corroding steel by aluminum and composite materials. Shells are made from lightweight DuraLite™ Double Welded Aluminum Structures and then wrapped by a layer of vacuum-laminated foam insulation making the whole box ultra-lite, flexible, robust and literally water and weatherproof. Wow! What a refined elegance, Ever Green "Element"
In 2011 EverGreen RV acquired going out of business manufacturer of luxurious fifth wheels – Carriage. This move gave them access to “know-how” and skills of company operating in the business since late 60’s. Soon after acquisition, Ever-Green launched its own fifth-wheel model under the brand name Lifestyle Luxury RV. The line of travel trailers includes the following series: Ever-Lite (13 floor-plans and various sizes), Sun-Valley (18 floor-plans including Limited Edition with various sizes), i-Go (designed for smaller towing cars, comes with 10 floor-plans), Ascent (for sedans, minivans, and small SUVs, coming with 8 floor-plans), Element (2 floor-plans) and Amped (it combines features of Travel Trailer and Toy-Hauler, comes in 5 floor-plans). Fifth wheels belong to the class of luxurious RVs and include series of Bay Hill (high-end, 7 floor-plans), Tesla (3 floor-plans, includes features of Toy-Hauler), Lifestyle (high-end, 9 floor-plans) and Alfa Gold (3 floor-plans). Interiors are matching expectations – plenty of light due to integrated skylights, privacy due to tinted windows, warm, energy efficient LED-base lighting - these are only few accents of what you will find in these “home away from home” trailers. Recently, EverGreen travel trailers were awarded with highest, certified Emerald Green rating! The company Micro-Lite Trailers was founded by Chuck Ornduff in 2005. The company name tells it all – they specialize in trailers that can be towed by small cars and even motorcycles. In other words – if you do not have an SUV, truck, van or any other 6+ cylinders gas-guzzler, then Micro-Lite can be one of your choices. It’s an “adventure” trailer with the sleeping place (queen-size comfy) and stalls for microwave, A/C, cooler etc. It also has an under-floor section for your camping gear. The optional roof rack can handle bikes. The solar panel and battery gives you much needed electrical energy. With its length of 12’2”, internal height of 4’ and weight of 950 lbs (GVWR 1990 lbs) it is a very-lite, low profile, fuel efficient trailer that can easily follow you on your adventure. With its internal height of 6ft, side door and large rear doors this trailer can be used either for cargo (quad, motorcycle, golf cart…) or furnished with flip and fold bench (opening to serve as bed) and kitchenette including fridge, microwave, A/C, water heater and stove. With its dry weight of 950 lbs, fully loaded 1,270 lbs and GVWR of 2,200 lbs it offers a lot of opportunities given its small size. It does not provide a full-height living space (internal height of 72” rear and 65.5” front), but hey, it is ideal for any wilderness adventure. It is a versatile, ultra-lightweight “all-aluminum” structure (that also includes aluminum-made cabinets, benches and bunks). 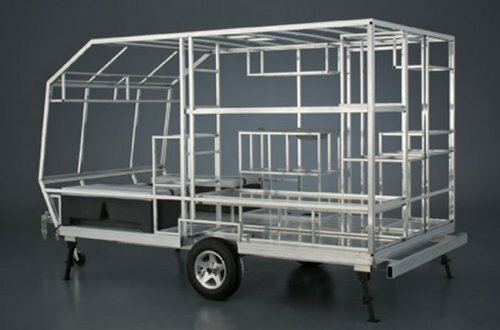 With its internal height of 79” (peak) and length of 14’6” it is the tallest and roomiest of all Micro-Lite trailers. Vymeron comes in five configurations. As a Traditional Trailer it has kitchenette (microwave, fridge, water heater, dinette), air conditioner & heater and can sleep up to four people. In the Bunk House configuration with kitchenette, it can sleep up to 5. In Toy Hauler configuration Vymeron can sleep 4 while providing 70” cargo area that can fit even an 8ft long motorcycle. Finally the Semi configuration provides “bunk-house” front end and open rear deck for cargo. With dry weight of 1,500 lbs and GVWR of 2,500 lbs it provides 1,000 lbs of cargo capacity. Tandem axles improve towing and provide stability when camping. Thanks to low profile, Vymeron can be easily stored in a typical garage. Hi-Lo was one of the pioneers of RV industry present on the market of leisure vehicles for almost 55 years. It was, because recent economic crisis and shrinking demand forced them to close the doors. It’s a clear loss for RV-ing community because Hi-Lo provided unique telescopic trailer designs with “raising-up” roof and unfolding side walls offering comfortable living area. But unlike traditional pop-up tent trailers, the whole “shell” was rigid and the opening/folding process was done with the assistance of spring-loaded air-struts or (for bigger units) - driven by electricity. It was then an easy “button-touch” process! (Now there is only one manufacturer pursuing this concept – Trail Manor). In 1977 Hi-Lo became part of the giant Thor Industries to be sold back to the original owners in 2003 (seems like in anticipation of harsh times down the road). c) easy (Touch-the-button) process of raising up and folding down. 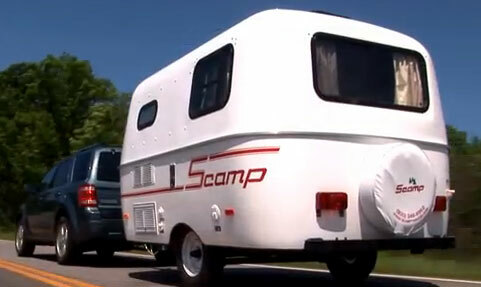 At the time, Hi-Lo travel campers were very popular, so it is worth to mention here the last model rolled-out from the factory in 2009: Hi-Lo Mojo. This was a “retro-like” teardrop travel trailer. Thanks to its weight of just 1,400 lbs it belonged to the class of lightweight trailers. With internal height of 75” and 16 ft length it offered “just enough” of headroom and space for “average” family.